Summer is here, and Texans have already seen rising temperatures. Warmer, drier weather can be hard on your garden and backyard, but composting is a great way to not only nourish your soil but reduce waste and save a little money. The Texas Commission on Environmental Quality’s Take Care of Texas program presents the video "How to Start Composting in Your Own Backyard." Travis County Master Gardener Patricia Mokry demonstrates a number of simple ways you can begin or improve your backyard compost pile. Compost forms when you mix together things like leaves, grass clippings, vegetable and fruit scraps, coffee grounds, and used tea bags. When combined with heat and water, the mixture breaks down into a nutrient-rich material that can enrich your soil. Take Care of Texas has a handy guide on mulching and composting for download. 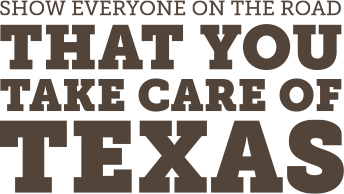 For more tips to keep our air and water clean, conserve water and energy, and reduce waste, visit TakeCareOfTexas.org. While you’re there, pledge to Take Care of Texas, and we’ll say thanks by mailing you a free Texas State Park Guide.